Living a Fit and Full Life: Stay on Top of Your Home's Security with EZVIZ's Mini 360 Plus Full-Room Coverage Smart Home Ready HD Video Camera! 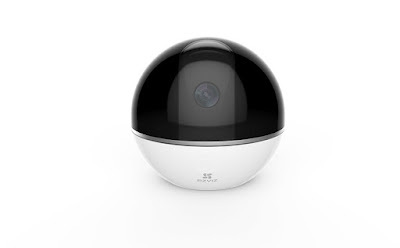 Stay on Top of Your Home's Security with EZVIZ's Mini 360 Plus Full-Room Coverage Smart Home Ready HD Video Camera! For those times when you’re away from home and the dog is digging through the trash, there’s two way talk. Just press the button on the EZVIZ app and let the camera’s built-in speaker and mic help you do the rest. With EZVIZ's Mini 360 Plus Full-Room Coverage Smart Home Ready HD Video Camera you can stay on top of your home's security! Currently my family and I are renting a home until our new build is ready which is getting incredibly close. So close that it's now become time to allow the landlord to show the our rental home to new potential renters. Since everything I own is also located in the rental house I was a bit concerned about what would take place during these showings with complete strangers. 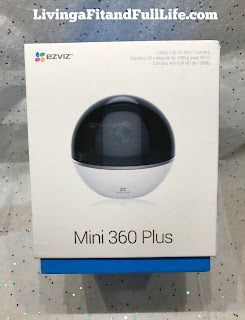 I set up the EZVIZ Mini 360 Plus Full-Room Coverage Smart Home Ready HD Video Camera in a few minutes and was completely blow away with how quickly I was able to do so since I'm not really the most tech savvy person around. One feature I love about the EZVIZ Mini 360 Plus is that I can take out my phone and press a button to pan around the room for a better view. Another terrific thing about the EZVIZ Mini 360 Plus is that is also has night vision so even when the lights are off I can still see what happening in the room. I also love the Two-Way Talk feature as does my husband who likes to use this feature while he's away to talk to the kiddos. I'm also in love with how crystal clear the video is and how well the app works. We've had a few house showings now and I've been able to check in with the app and feel totally secure even while away thanks to the EZVIZ Mini 360 Plus. The EZVIZ Mini 360 Plus Full-Room Coverage Smart Home Ready HD Video Camera is completely amazing and I highly recommend it!